A survey of a group of 1250 students is conducted to know about their likeness of sports. 68% students like Football, 69.6% like Cricket and 64% like Badminton. 14.4% of them like only Football, 16.8% like only Cricket and 8.8% like only Badminton. Now, answer the following questions based on this information. What per cent of the students like, at most, one sport from the given sports? Suppose, x students like both Football and Cricket, y students like both Football and Badminton, z students like Badminton and Cricket and k students like all three games. How many students are there who like any two sports from the given three sports. What per cent of the students like Football and Badminton both but not Cricket? How many students are there who like all three sports? 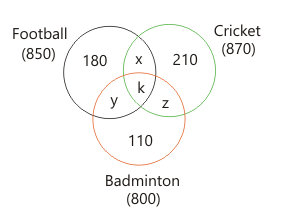 We can clearly get from the common explanation that, there are 520 students (representing k) who like all the three sports. 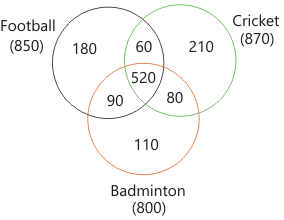 What per cent of students like both Football and Cricket but not Badminton?